Arziel Hill grew up just outside of Dallas, Texas working at odd jobs while he sang on Sundays with local Gospel group The Spiritual Five. He eventually began singing R&B in area clubs, and took to calling himself Z.Z. because it sounded more 'bluesy' (you know, kind of like B.B.). Z.Z. 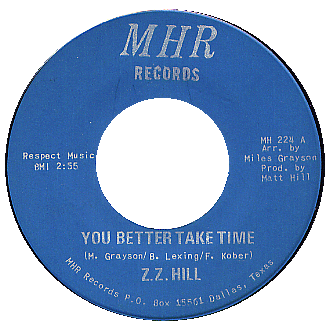 's brother Matt was a 'record man' out on the west coast, and convinced him to come out and record for his label M.H.. His first release on the label, You Were Wrong, became a local hit, actually reached #100 R&B in the Spring of 1964, and launched Z.Z. 's career. 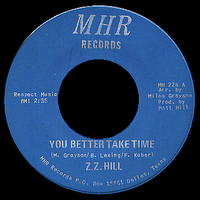 One more single on M.H., and one on MESA would follow, before Hill moved to the Bihari brothers' KENT label later that year. He recorded prolifically for them, waxing some 15 singles over the next 4 years, although none of them would chart (yet). Z.Z. became a fixture on the 'chittlin' circuit', out there in the clubs night after night opening for the big names. When Kent declined to pick up his contract in 1969, he signed with Atlantic. 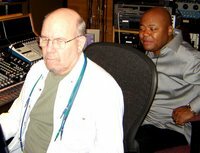 Quin Ivy had recently completed work on his new Quinvy studio down in Muscle Shoals around this time, and Jerry Wexler sent Hill down to Sheffield to work with him. 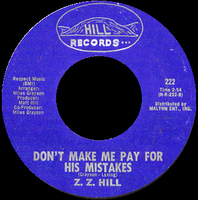 Ivy brought in his new partner, Nashville producer Bob Wilson, who came up with, in my opinion, one of the best records Z.Z. ever made. 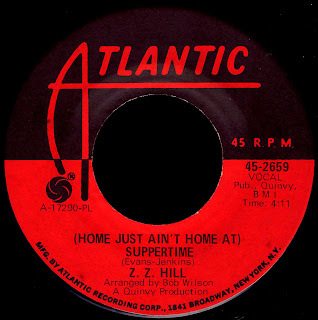 Even though Wexler was impressed with it, (Home Just Ain't Home At) Suppertime (Atlantic 2659) didn't receive the promotion it deserved from the big company, and Atlantic lost interest when it didn't sell. There would be one more release on Ivy's own Quinvy label that they half-heartedly picked up for distribution in 1970, which was just before Quin packed it in and quit the business. Left without a contract, Z.Z. reunited with his brother Matt. 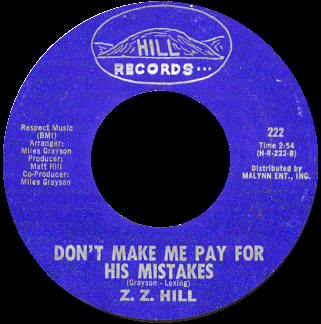 As it turned out, it was a good idea, as Don't Make Me Pay For His Mistakes put Z.Z. back on the charts, climbing to #17 R&B. The Biharis saw their chance, and re-released a re-mixed version of the B side pictured above, sending I Need Someone (To Love Me) to #30 in the Summer of 1971. Z.Z. next hooked up with the legendary Jerry "Swamp Dogg" Williams, charting with three out of his five releases on his MANKIND label. 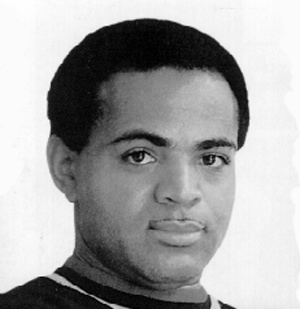 Brother Matt's connection with United Artists then paid off, as he continued his string of moderate chart hits with six singles released on UA/HILL in the mid-seventies. Meanwhile, Disco was everywhere. The fact that his records were charting at all during this period was amazing, and indicated that there was indeed an audience out there for his type of music. Enter one Dave Clark. No, not the "Glad All Over" guy, but one of the secret weapons of southern soul. Dave had gotten his start as a front man for Jimmie Lunceford and promoter of DECCA's 'race records' division in the late thirties. 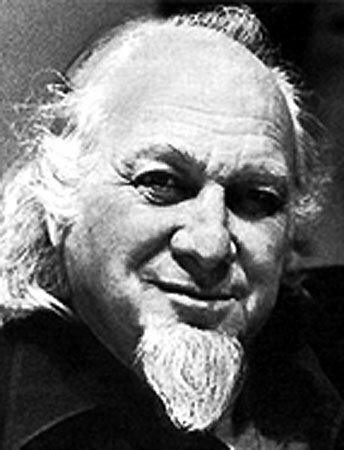 Don Robey, sensing the power of his connections in black radio, offered him an exclusive deal as A&R and promotion man for his DUKE/PEACOCK empire in the mid-fifties. 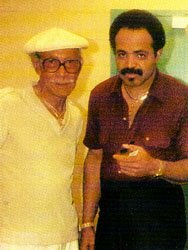 When Robey sold out to ABC in 1973, Clark went to work for Al Bell over at STAX. When THEY went belly up two years later, Dave was snatched up by another major player on the Southern R&B front, Henry Stone. Stone was a vinyl distributor in Miami who went on to become a partner in KING subsidiary DELUXE, as well as in many other small independent labels. His position as the Southern distributor for Atlantic, Motown and Stax in the late 60s and early 70s, put him square in the middle of what was goin' on in the Soul world. When Atlantic was sold to Warner Brothers, and started handling their own distribution, Stone set up shop himself with a variety of classic Southern Soul labels like, GLADES, ALSTON, KAYVETTE and, of course, T.K.. He continued to distribute other labels as well, like MALACO. 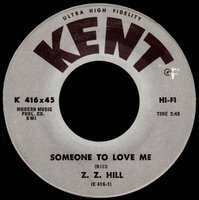 As we've discussed here before, it was Stone who became the Malaco/Chimneyville distributor when Atlantic dropped them shortly after King Floyd hit big with Groove Me in 1970. 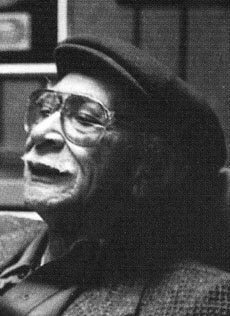 It was TK's distribution of Dorothy Moore's Misty Blue in early 1976 that saved the label from going bankrupt entirely. 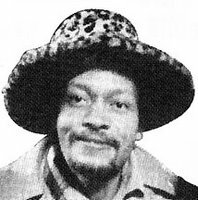 Stone was riding high with one major disco hit after another by folks like George McRae and KC and The Sunshine Band, and was using Dave Clark to his advantage, pushing records like the Frederick Knight produced Ring My Bell (on his Malaco affiliated Juana label) to #1 in the summer of 1979. George Jackson had been around the Southern Soul scene a long time, both with his own records (like the great Aretha, Sing One For Me) and as a much respected staff songwriter for Rick Hall in Muscle Shoals. He wrote for everyone from Clarence Carter and Candi Staton to the Osmond Brothers ("One Bad Apple") and Bob Seger (Old Time Rock and Roll)! In one of those incredible right place at the right time moments, Couch and Stephenson suggested that Z.Z. cut a song Jackson had written for his next album, and basically changed the course of history. In 1981, Down Home Blues took everything that had been going on in black music and summed it up perfectly for a whole generation of fans; "...take off those flash records, and let me hear some down home blues! ", essentially defining an entire genre. 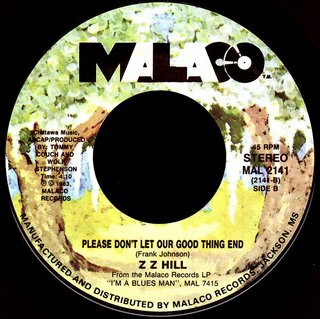 In a stroke of brilliance, Malaco refused to release the record as a single, making Down Home the biggest selling "Blues" album ever, with sales of over a half-million. When another cut from the record, the Jackson penned Cheatin' In The Next Room, was released in early 1982 it spent 20 weeks on the charts, breaking into the top 20 nationally. Z.Z. was on top. Now a "Blues" superstar, he shared top billing with folks like B.B. King and Bobby Bland. His next album, The Rhythm & The Blues, contained one of his biggest regional hits, Denise LaSalle's Someone Else Is Steppin' In, but it failed to crack the national charts. 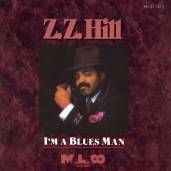 The excellent I'm A Blues Man would follow in late 1983, and is considered by many to be his best album. Tragically, his career was cut short by complications from an embolism and he died in April of 1984. His funeral in his home town of Naples, Texas drew thousands of people, including future Malaco signees like Johnnie Taylor and Little Milton. Today's B side is the flip of a 45 of Down Home Blues that Malaco released (finally) after Z.Z. 's passing. This excellent song is taken from the I'm A Blues Man LP. I just love the production... flutes, and all! 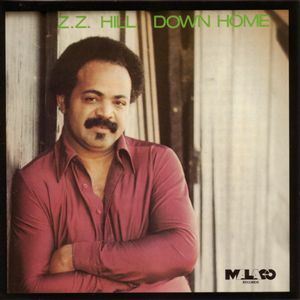 Malaco took this cut and over-dubbed Dorothy Moore's vocals to create a "duet" for the 1994 star-studded tribute album Z.Zelebration. It's good, but I like the original better. On my famous swing through the South this past May, the folks at Malaco were kind enough to let me poke around the studio a little bit. Long time Malaco engineer and producer Jerry Masters allowed me to join him and Darell Luster, vocalist for The Sensational Nightingales, as they mixed down a track from their forthcoming album. It was an incredible experience, and speaks volumes of the kind of relaxed and friendly company Malaco continues to be to this day. Z.Z. 's brand of music is, I believe, misunderstood by Soul and Blues fans alike. When you say "Blues" in Mississippi it has an entirely different meaning than it does to the Stevie Ray Vaughan crowd, know what I mean? Excellent AM radio station WKXI 1400 in Jackson bills itself as 'all-blues', but that means something entirely different... it means, well, "Down Home Blues", I guess. To me, that is what has become of "Southern Soul"... it's alive and well and living under this assumed name. with Solomon Burke, Denise LaSalle, Bobby Womack, Clarence Carter, Marvin Sease, Bobby Bland and Latimore. Z.Z. would be proud, man. My wife and I just got tickets. Come on out! Red, you really take me back with these songs. Love this one! But I was hoping the link to "Misty Blue" would lead me to the actual song. Don't think I've heard it since the '70's - it was a favorite of mine. I am so happy I found your blog!! Welcome back! "Misty Blue", along with about 100 other GREAT Malaco tracks is available on the truly amazing 6 disc box set THE LAST SOUL COMPANY. The excellent liner notes by Rob Bowman are worth buying on their own, go for it! This is a great post. ZZ Hill was truly one of the pioneers of the "soul blues" thing, which is indeed pretty confusing and fraught with racial and commercial meanings. One of these days I'm going to do a post about that. Nice one, Red. 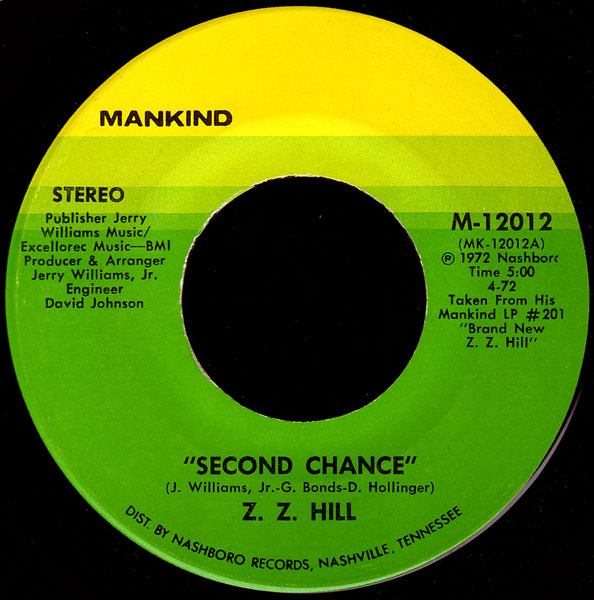 I wasn't much into ZZ until I discovered the stuff he did with Toussaint back in the mid Seventies. Then, I went back and re-assessed! I got a bunch of his 45's in last summer's big lot - and still haven't heard 'em all. Malaco is such an under-rated label by collectors. Wonder when that'll change. Another great post. A mine of information as always. Thanks. "...Stealing It" is one of the great soul records and as you say came after the sun had set on the golden age. My condolences on your hard drive; I know your pain! Keep on doing amazing work! What a wonderful tribute to a wonderful man. I knew him in the early 70's and loved him dearly. Find B.B. King Blues Festival Tickets. By the way, enjoyable informative blog. spend making "Down Home" folks like me feel down home.